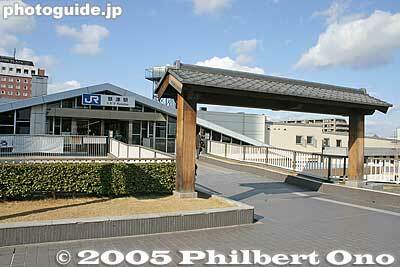 JR Notogawa Station shaped like a waterwheel. The train station is a gateway to the local area. First-time visitors may get their first impressions of a city or town from the train station. It’s like the genkan (foyer) of your house where you might keep a vase of flowers or a painting to impress visitors. Although I don’t judge a place by its train station, I do take note of how nice the train station is. 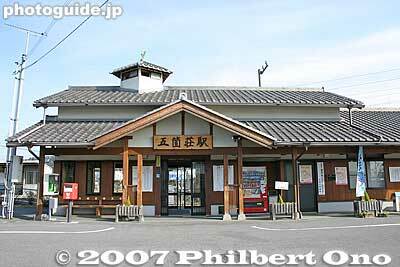 After seeing most of Shiga’s train stations (totaling about 120), I’ve picked and ranked Shiga’s Top 20 train stations. My selections and ranking are based on architectural and aesthetic design, incorporation of the local flavor/character/community, and uniqueness. 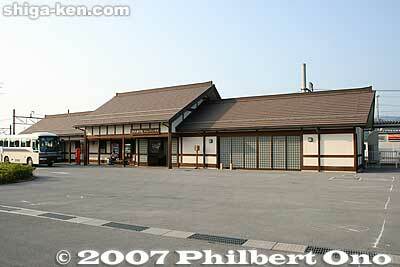 Quite a few train stations in Shiga have been rebuilt in the last 10-15 years. Most of them have incorporated the local flavor quite well. 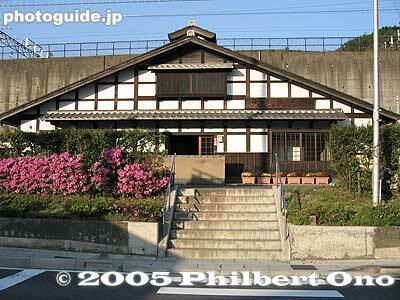 Ohmi Railways have Shiga’s oldest train stations which seem to take you back to the prewar days. Due to their look and feel, they retain a historic charm in this modern age. Very appropriate calligraphy art in JR Maibara Station saying “Welcome home” and “I’m home.” By the Ibuki High School Calligraphy Club for Golden Week 2013. Train stations on the JR Kosei Line along western Shiga are mostly faceless and featureless in gray concrete as they are built under elevated train tracks. They all look the same. Takashima Station, though, has a giant statue of Gulliver right outside. And Ogoto Onsen Station recently got a nice touch with a free hot-spring foot bath nearby. At No. 1 is Nagahama Station. The station building, rebuilt from the ground up in Oct. 2006, is modeled after the station’s first and original building from 1882. They did a great job combining the old and the new. 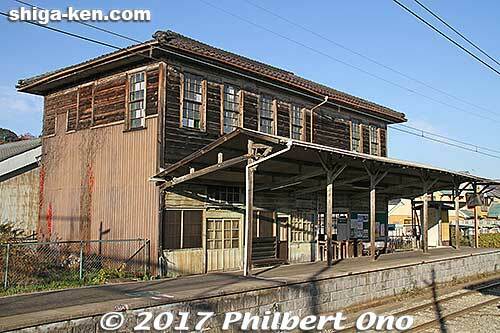 To fully appreciate the new station building, you have to see the original 19th-century station building which is preserved a short distance away at Nagahama Railroad Square, a train station museum with a few retired trains. The resemblance is impressive. Nagahama Station is airy, attractive, and functional. A great improvement over the old and boring train station built in 1955. Near the turnstile is a nice, air-conditioned waiting room that also houses the tourist information desk. The waiting rooms on the train platforms are also convenient, but somewhat small. When you go down the exit escalator on the east side (Ekimachi Terrace/Mondecool), you see a beautiful stained glass mural of Hikiyama Festival kabuki actors. The new station was built on land adjacent to the old train station that was torn down. The location of the old train station is now occupied by a monstrous wedding hall dwarfing the new train station building right next to it. Although the wedding hall has a similar design as the station building, it almost totally cancels out the station building. It’s a real shame. On the other hand, the new low-rise Heiwado shopping mall called Mondecool is nicely connected to the train station without overwhelming it. JR Notogawa Station, east side. Another one of my all-time favorite train stations. Rebuilt in 2003, the Notogawa Station building is shaped like a giant waterwheel, the symbol of Notogawa town before it merged with Higashi-Omi in 2006. Notogawa has this giant waterwheel at a local park. The waterwheel design is on both the east and west sides of the train station. It’s so distinctive and very impressive. I loudly applaud the people who planned and designed the building. The building’s waterwheel structure houses an escalator on one end and stairs on the other. The west side of the station has other waterwheel-themed objects, not to mention a local shopping center also bearing waterwheel designs. Although there are train stations in Japan with a real waterwheel next to it, it seems Notogawa Station is the only one that is shaped like a waterwheel. 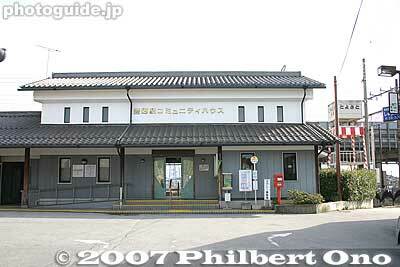 Higashi-Omi’s sole JR train station. Ninja painting fused with a bench in JR Koka Station, Koka. One of Japan’s most uniquely localized train stations. 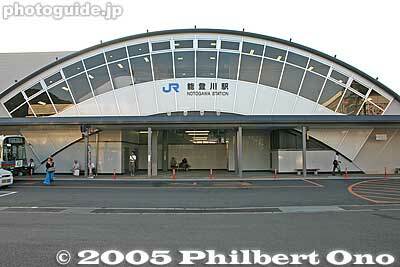 JR Koka Station opened its new station building in Nov. 2005. It resembles a farmer’s kura storehouse on the outside. But the inside has a number of visual surprises with ingenious, interactive ninja wall paintings. 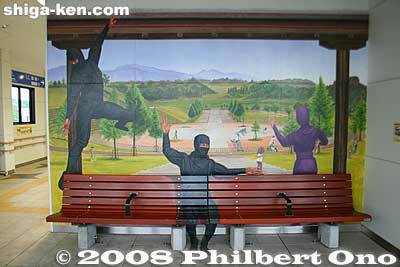 Koka is famous for Koka/Koga ninja, and the station plays this up with ninja motifs and playful 3D ninja paintings. Thanks to some very clever optical illusions called “trick art,” you can join in the virtual ninja world by posing inside the painting. (Get your camera ready.) The seven ninja wall paintings were painted by Hattori Masashi (服部 正志), a noted artist. They should rename the station, “Ninja Station.” That would attract more attention and tourists (it would also cost a good bit of money). 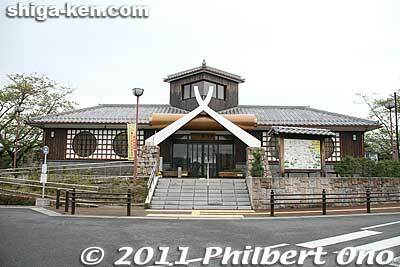 Koka’s authentic Ninja House and Ninja Village amusement park are popular attractions. The station building’s first floor has display cases of medicines produced by Koka drug companies. The abundant herbs in the area gave rise to many druggists in Koka. The ninja were also expert with drugs and chemicals. The name “Koka” is often mispronounced as “Koga” (as in Koga ninja) by Japanese and foreigners alike. The proper pronunciation is “Koka.” FYI, there’s another ninja train station at Ueno-shi Station in Iga, Mie, famous for Iga ninja. Enryakuji Station atop Mt. Hiei. Mt. Hiei and Enryakuji temple (World Heritage Site and National Treasure) are accessible via cable railway from Cable Sakamoto Station in Sakamoto at the foot of Mt. Hiei in Shiga. At the top, you get off at Cable Enryakuji Station. This is the original building that has been used since the cable railway opened between Sakamoto and Mt. Hiei in 1927. It was Japan’s longest cable car route (2,025 meters) at the time. The first floor is the station, while the 2nd floor used to be a VIP room. The 2nd floor is now an exhibition room open to the public. It also has a nice lookout deck. The distinguished-looking building is a National Registered Tangible Cultural Property (登録有形文化財). 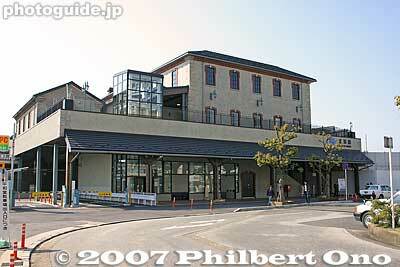 Shiga’s oldest train station buildings are on the Ohmi Railways, and Shin-Yokaichi Station is one of them. It’s a Western-style, two-story wooden building built in 1913. The ground floor looks very old, the benches look historic. Enter a time warp here. The building obviously needs repair in multiple places, but it is still usable. The second floor is closed to the public due to old age. It originally housed the Konan Railway company’s head office (湖南鉄道). Konan Railway originally operated the railway between Yokaichi and Omi-Hachiman before it merged with another company that later merged with Ohmi Railways. 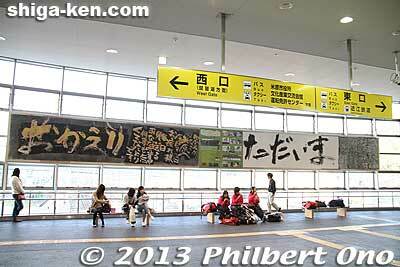 Tourists don’t normally get off at this station since most attractions are at the next stop, Yokaichi Station. Although it almost looks like a condemned building, I hope they keep it for as long as possible. I like it. But there doesn’t seem to be any toilets in the station. The front wall even has a sign saying, “No urinating” (for men). The toilets were removed some time ago due to old age. Update: Sadly, this train station building was torn down in Aug. 2014. It’s no longer there. No replacement building either. Toriimoto Station platform and building. Another example of a prewar Western-style train station building. It has been here since the station first opened in 1931. It has a red mansard roof, perhaps unique in Shiga. The compact interior also reeks of the good old days. If its walls could talk, I can only imagine what stories they could tell. It looks kind of lonely, but beloved by local residents since it was originally built upon request by the local government and residents. Most of the construction cost was therefore borne by the locals. There’s no train station staff so it’s really empty and quiet when there are no trains. Toriimoto was the sixty-third shukuba post town on the Nakasendo Road. It has a nice section of traditional shukuba buildings. Shigaraki Station’s little, modern building is nothing special, but it’s embellished with tanuki (raccoon dog) statues, including a giant tanuki right outside to greet visitors. It’s one example of how to make a plain train station into a special one: Decorate it local-style. 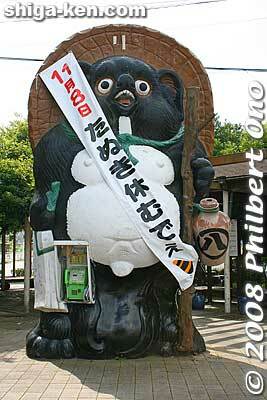 The tanuki is a symbol of Shigaraki/Shiga and a common sight in Japan with shops and restaurants displaying a tanuki outside the entrance. It has various symbolic meanings. The Shigaraki Kogen Railway closed for a time as it underwent repairs of the substantial damage wrought by Typhoon Man-yi in Sept. 2013. Riding on Shigaraki Kogen Railway always reminds me of that terrible tragedy on May 14, 1991 when a Shigaraki Kogen Railway train collided head-on with a JR train near Shigarakigushi Station. The trains were packed with people attending the World Ceramic Festival being held at the newly opened Shigaraki Ceramic Cultural Park. Sadly, 42 people died and 628 were injured. Many of the victims were young students and it is one of Japan’s worst train accidents. The train station has a small exhibit about the accident. When you read about how it happened, it’s hard to believe how negligent the train operators were. It was a horrific scene and I was shocked because I had visited the World Ceramic Festival via the railway only 10 days before the accident. Years later, I visited and prayed at the prayer monument near where the accident occurred. A memorial service is held there annually on May 14 attended by railway officials and relatives of the victims. 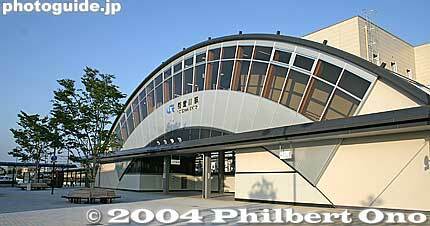 Opened in March 2000, Echigawa Station’s building is a well-designed and well thought-out building. There’s a community space with a gallery and tourist information desk. 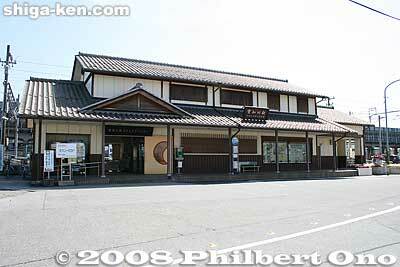 The station exterior resembles a traditional building in the old post town of Echigawa nearby on the Nakasendo Road. Well, the round windows have a shuriken (throwing knife) design. The station also has rental bicycles. Shiga’s southernmost train station next to the prefectural border with Mie Prefecture. When my train to go home (after seeing the Aburahi Matsuri) arrived at the station, I almost felt sad to leave such a comfortable train station. Love the inside of Gokasho Station. The warmth of wood envelopes you completely almost like a large sauna (without the heat and steam). When I visited, it still had a woody fragrance. Nice traditional-style building inside and out. It was designed to match the Omi-shonin merchant homes in Gokasho. The building was built in 2000 and it still looks new. Adjacent to the train station building is a matching building housing the retirees’ employment office where you can rent bicycles. Note that the kanji character for “ka” in Gokasho Station (五箇荘駅) is different from the one used in the place name “Gokasho” (五個荘). In Oct. 2006, the JR Hokuriku Line switched to direct-current electrification between Nagahama Station and Tsuruga Station (Fukui). This enabled faster and modern Shin-kaisoku (Special Rapid) trains from Kyoto to reach train stations north of Nagahama Station directly (Torahime, Kawake, Takatsuki, Kinomoto, Yogo, and Omi-Shiotsu Stations). Before the switch, passengers had to transfer trains at Nagahama Station to go further north. Anticipating a substantial increase in visitors, new train station buildings were built at Nagahama, Torahime, Takatsuki, and Kinomoto Stations. However, by March 2008, the passenger increase was only 0.5 percent, far below what they had hoped for. Built slightly north of the old station building and opened in Oct. 2006, the new Kinomoto Station building is modern with a traditional look. Spacious and airy and well designed for function and aesthetics. A lot bigger than the old station building. The train station sign is also wooden like on the old train station. (“Kinomoto” means “origin of wood.”) Next to the exit on the ground floor is a large space selling local products and a tourist information counter. 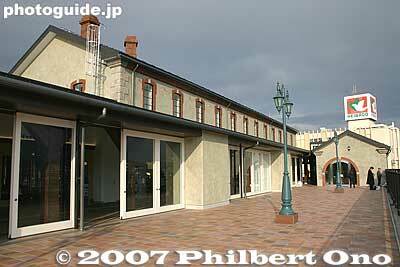 The old and much smaller Kinomoto Station building has been retained as a small exhibition space. 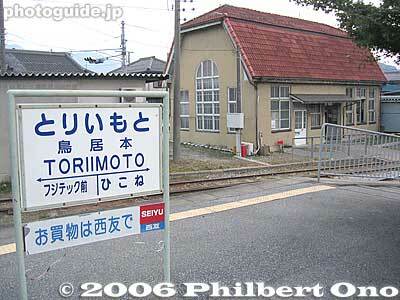 Kinomoto Station is where you get off to take a bus to breathtaking and historic Mt. Shizugatake. There’s also a giant Jizo statue nearby. Visiting Kinomoto is highly recommended. Note that Kinomoto Station in Japanese (木ノ本駅) uses a different kanji from the one used for the place name Kinomoto (木之本). Unique building with a high tower in the center reminiscent of ancient Shinto shrines which were elevated to be closer to the gods. It also might be a play on the name “Takamiya” which literally means “high shrine.” The station building was rebuilt in March 2002. The station is near the old Takamiya-juku, the sixty-fourth of the sixty-nine stations or shukuba post towns of the Nakasendo Road. Near the station is a large torii leading to Taga Taisha Shrine in neighboring Taga. The loghouse is a common building design, but Nagahara has a good reason to use it. Before railroads were built, this area was a port town teeming with wooden maruko-bune boats plying across Lake Biwa between Otsu and this area of northern Lake Biwa. The trademark of maruko-bune was a semi-round log (maruko) along the sides of the boat. Nearby is the Maruko-bune Museum. The station building was rebuilt in April 2000. The inside was kind of dark and musty when I visited some years ago, but I liked the exterior. Hino Station is another old station that takes you back to the prewar years on the inside. It has a nice vintage look and feel inside. The station building is the original one built in 1916. However, outside the station building, there are just too many modern objects that clutter the vintage facade: A waiting taxi (and often a bus), phone booth, and vending machine (always the worst offender). Otherwise, I would rank this station higher. In late Dec. 2016, plans to renovate the station were announced and donations are being solicited to cover the cost. Next to the station is a small tourist information office that is always helpful especially during the Hino Matsuri float festival, blooming Shakunage Gorge, and other local festivals. Hino Station is Hino town’s sole train station and one of the main stations on Ohmi Railways. Update: Hino Station completed major renovations on Oct. 1, 2017 when a ceremony was held. Although the building’s shape has been basically retained, it looks brand new inside and out with a new paint job, etc. The exterior is now dark brown. I shall miss the old Hino Station. Torahime Station rebuilt its building in March 2006. Very nice woody building inside and out. There’s a commercial space where a bakery once operated, but they have since left and finding a suitable tenant has been a problem. Outside the station, there’s a statue of the Tiger Princess (which is what “Torahime” means) and the small Torahime Shrine (popular with fans of the Hanshin Tigers baseball team in Osaka). Someday, I want to see the cherry blossoms at nearby Toragozen-yama. Nice traditional-looking structure rebuilt in Sept. 1995 to look like a lodge. The wooden sign says “Kaido Ajikama Lodge” (海道・あぢかまの宿). It was the name of a real lodge that existed in here in Shiotsu, a former post town along the Hokkoku Kaido Road (北国街道) going from Maibara/Nagahama to Fukui and the Hokuriku Region. Inside, the arch-shaped corridor to the train platforms reminds me of an underground military bunker. 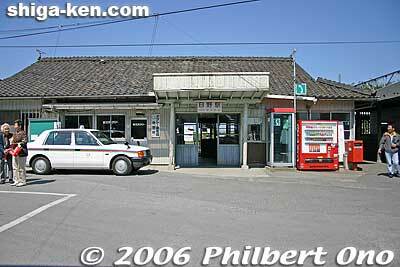 Omi-Shiotsu Station is where you transfer trains between the Hokuriku Line and Kosei Line. 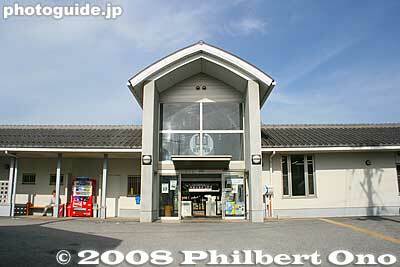 Remember this station if plan to travel around northern Lake Biwa by train. Nothing much nearby. 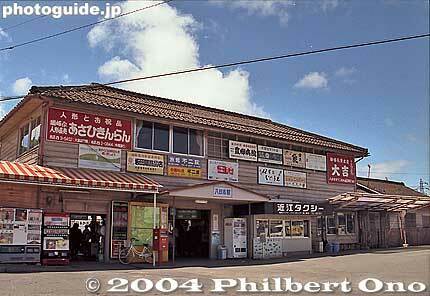 Rebuilt in the late 1990s, Toyosato Station’s building looks like an Omi merchant’s home or storehouse. A testament to the many Omi merchants who once lived in the area, including Itoh Chube’e, founder of Itochu, one of Japan’s leading trading companies. His home is open to the public. If you see an umbrella or umbrella design in the station, it refers to the Goshu Ondo song and bon dance co-founded at Senjuji temple (千樹寺) in Toyosato. These days, Toyosato’s main attraction is the Toyosato Elementary School made famous by the popular K-ON! anime/manga series in 2009-2010. The train station is in a quiet neighborhood with stone statues of a tortoise and hare showing you the way to the elementary school. The station’s slanted roof lines are similar to the roof of the Kusatsu Honjin, one of Japan’s best preserved Honjin used for VIP lodging in former post towns. A traditional-looking gate (photo) and a road marker on the pedestrian deck add a nice touch. Although it has nothing to do with the architecture, the best thing I like about Kusatsu Station is the little tourist information booth right outside the turnstile. As soon as you give your ticket to go out, it’s right there. When staffed during the better part of the day, they are very helpful with directions to places. Local-area tourist pamphlets are also available at all times. One of my pet peeves is that JR train stations always have tourist pamphlets in plain sight, but for a different destination. They don’t stock tourist pamphlets for the place I just arrived at. Why not have tourist pamphlets for that place? I just spent a good amount of money to get there, and now they want me to go somewhere else?? They should also care about inbound people, not just outbound. When a tourist gets off the train, the first thing he/she wants is a map of the place of arrival. Instead, you have to search for the map signboard or tourist info office if there is one. But Kusatsu Station is the rare exception where the tourist info booth and local brochures are right there. A few train stations in Shiga have a tourist information booth right outside the turnstile only during major festivals. Kusatsu Station is Shiga’s busiest train station with the highest daily average of boarding passengers exceeding 27,000 in 2012. 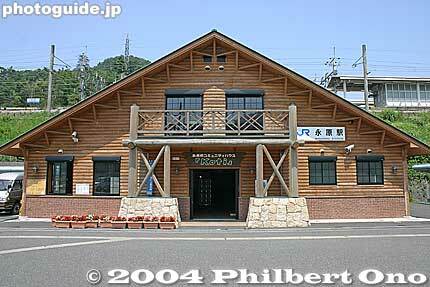 The second busiest is neighboring Minami-Kusatsu Station with over 24,000 passengers daily. In comparison, Otsu Station sees over 17,000 passengers daily and Kyoto Station has over 185,000 passengers. These numbers do not include the number of people getting off the train. The building is shaped like a shrine building, to match Taga Taisha Shrine and the large torii right outside. An exhibition space (waiting room) is integrated with the station building rebuilt in 2002. The quality of the exhibitions is good when there are exhibitions. A large showcase displays ema prayer tablets from many shrines. The station is the end terminal of the Taga Line. Taga Taisha Shrine is a short walk away. Nagahama Station before the wedding hall and pedestrian overpass were built. Incorporating the train station with local elements certainly boosts visitors’ impressions and the local folks’ pride and morale. People are starting to realize that the train station itself can be a tourist attraction. Just look at the magnificently reconstructed Tokyo Station and the nyan-nyan Kishi Station in Wakayama. People in Otsu should take note when they think about how to revitalize the Otsu Station area. To attract more people, make the train station the attraction. 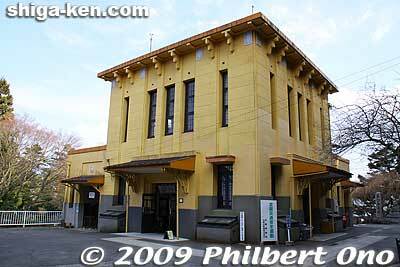 How about filling the station building with B-kyu (B-grade) gourmet food stands? Cheap but delicious local food always attracts people. Great if we could eat B-kyu food year-round in Otsu instead only once a year. Right now, most of the restaurants in and around Otsu Station are nothing special. The Otsu Station area needs to have something special that Hama-Otsu doesn’t have and preferably found nowhere else in Japan. Update: After major renovations, the Otsu Station building reopened on Oct. 1, 2016 with a 60-bed capsule hotel (geared for foreign tourists), multilingual tourist information center, free rental bicycles, five restaurants, and an outdoor terrace and event space. 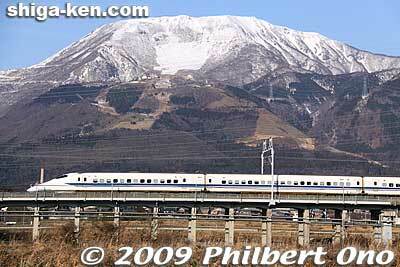 Shinkansen speeding past Mt. Ibuki. Today, it’s hard to imagine life without trains. Japan’s first railway opened between Yokohama and Shimbashi (Tokyo) in 1872. Shiga laid its first railway 12 years later in 1884 between Nagahama and Tsuruga (Fukui). In 1889, the Tokaido Line was completed. In 1900, Ohmi Railway opened a train line between Hikone and Kibukawa. The Keihan Line in Otsu started running between Hama-Otsu and Ishiyama-dera in 1914. The defunct Kojaku Railway Line (江若鉄道) opened between Miidera Station and Eizan Station (now Hiei-zan Sakamoto Station) in 1921. It was the predecessor of the JR Kosei Line that took over in 1974. All these railways gradually extended their lines to what they are today. In Oct. 1964, the shinkansen started stopping at Maibara. If there’s one thing that has improved in Japan, it’s rail transportation. Trains have gotten faster, cutting travel times significantly. Train/subway lines have also increased or been extended, mainly in urban areas. Trains are also more comfortable with non-smoking cars and Western-style toilets. Can you imagine that until the 1980s, smoking was allowed in most train cars, train stations, and platforms? Older folks may remember seeing cigarette butts all over the train platform and an ash tray in front of all the train seats. Most of the shinkansen cars also allowed smoking. It wasn’t until the 1990s when non-smokers’ rights gained traction and most or all train cars and stations started to prohibit smoking. Thank goodness. This trend has spread to other public places such as restaurants and even city streets and beaches. Excellent. 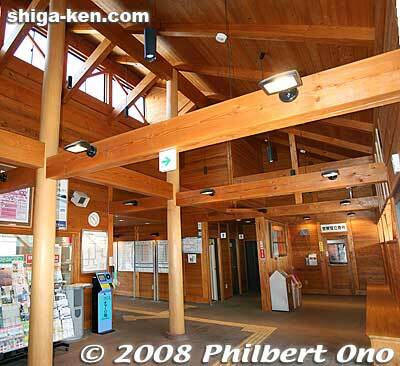 Of course, many train station buildings have also much improved with brighter, cleaner, and more spacious interiors. Restrooms also tend to have toilet paper and sometimes even soap as an added bonus. Major stations also have escalators and elevators. I remember Tokyo Station had a small army of hardy men called “Akabo” (Red Caps 赤帽) who were red-capped porters earning tips by carrying your heavy luggage up or down the stairs. They made a decent living when suitcases still didn’t have casters and there were no escalators. Akabo at Tokyo Station became extinct in March 2001. I wish I took a picture of them. Another major improvement and development is the employment of women as train conductors and drivers. Once upon a time, we never ever saw women train conductors and drivers. Now they are quite common. Sorry that this blog post turned out to be longer than I expected. Often one topic leads to another story or tidbit. I’m not really a train fan except for the shinkansen, but trains are a fact of life in Japan and a great convenience. Old Yokaichi Station building before it was torn down in 1997. 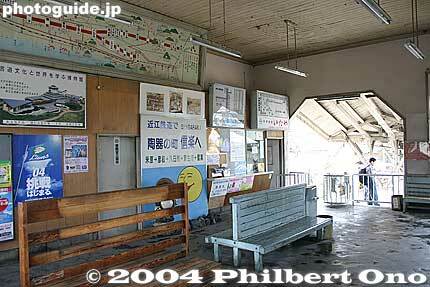 Inside the old Ohmi Railways Maibara Station building before it was torn down and integrated with the JR station. machiai-shitsu 待合室 – Waiting room in the train station. A room to keep warm in winter or cool in summer while waiting for your train. Most train stations have a small waiting room on the platform. kaisatsu 改札 – Turnstile or gate where you present your ticket or tap card. Chronology of Shiga Prefecture’s news bits for January-March 2014 (according to the year, month, day, and time posted at Japan time). Taga Taisha on Jan. 1, 2014. 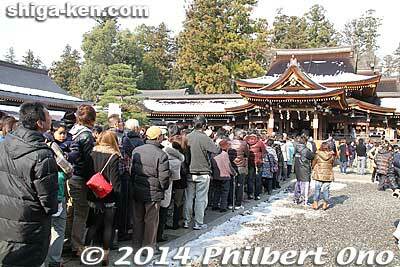 2014/1/4 4:56 During Jan. 1-3, 2014, Taga Taisha saw 490,000 worshippers (5,000 more than last year), Omi Jingu 150,000, and Nagahama Hachimangu 150,000. 2014/1/7 15:33 Hikone’s official mascot, Hiko-nyan, received 12,352 New Year’s postcards from all over Japan and even Taiwan during Jan. 1-6, 2014. 2014/1/16 14:01 Construction of Niu Dam in Nagahama to be canceled as per the Kinki Regional Development Bureau’s decision to improve river systems instead. 2014/1/16 14:12 Himeno Kaoruko 姫野カオルコ, from Koka, has won the prestigious Naoki Prize for her novel, “Showa no Inu” 「昭和の犬」 (Dog of the Showa Era). 2014/1/20 17:22 Moguls skier Miki Ito from Hino and halfpipe snowboarder Rana Okada from Otsu will represent Japan at the Sochi Winter Olympics. 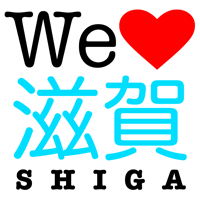 2014/1/24 14:26 Led by fraud and auto theft, the number of crimes in Shiga in 2013 increased by 2% to 15,448 over 2012 amid an average crime rate of -4.4%. 2014/1/28 12:12 To curb the declining no. of visitors (360,000 in 2013), Lake Biwa Museum’s exhibits will have a major overhaul for its 20th anniv. in 2016. 2014/1/28 12:23 Pay cuts for most of the 17,000 Shiga Pref. employees (police, teachers, etc.) since 2003 will be abolished at the end of this fiscal year. 2014/1/30 11:59 Flu and viral gastroenteritis warnings issued in Shiga. Higashi-Omi, Koka, & Otsu have the most flu patients. Wash your hands, avoid crowds. 2014/2/6 13:35 Visitors to Mt. Ibuki will start paying ¥300 on weekends and holidays this May-Nov. 2014. To help maintain hiking trails, toilets, & flora. 2014/2/7 13:29 Sadly, Miki Ito is unable to compete at Sochi due to her injured right knee. She withdrew from the Women’s Moguls Qualifying Runs 1 and 2. 2014/2/12 18:36 Otsu native Rana Okada 岡田良菜 placed 5th in the ladies’ halfpipe at the Sochi Olympics. The highest ever for a Japanese in this event. 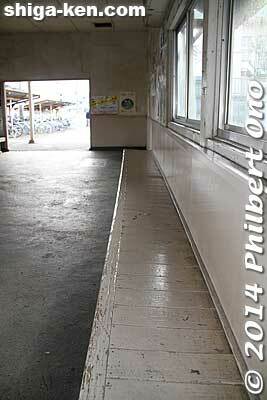 2014/2/28 2:25 Shigaraki Kogen Railway aims to reopen in Dec. 2014 after starting repairs in March. Buses currently ply between Kibukawa-Shigaraki. 2014/2/28 8:46 Feb. 26: Notogawa High School students in Higashi-Omi marked Pink Shirt Day by wearing pink “No Bullying” T-shirts at a nursery school. 2014/3/1 10:40 The hundreds of tons of radioactive wood chips abandoned along Kamo River in Takashima last April was finally removed on Feb. 26. 2014/3/3 2:25 Mar. 2: Ethiopian Bazu Worku won the 69th Lake Biwa Marathon in 2 hr 9 min 10 sec. Satoru Sasaki 佐々木悟 was 2nd, and Yuki Kawauchi 川内優輝 3rd. 2014/3/6 13:07 The Shozu-no-Sato Committee 針江生水の郷委員会 in Harie has won the top Ecotourism Grand Prize エコツーリズム大賞 sponsored by the Japan Ecotourism Society.e Japan Ecotourism Society. 2014/3/8 6:34 The movie, 偉大なる、しゅららぼん (Idai na Shurara Bon), filmed in Shiga, opened today. Main stars appeared at Marunouchi Toei theater at 2 pm in Tokyo. 2014/3/27 9:14 Gov. Yukiko Kada still has not announced whether she would seek reelection on July 13, 2014, election day. 2014/3/27 9:22 Kusatsu, having Shiga’s highest rate of bicycle thefts, is Japan’s 2nd city to have a law requiring bicyclists to lock their bicycles. 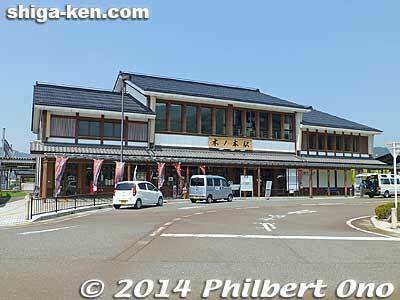 2014/3/28 12:34 2.06 mil tourists visited Hikone in 2013, 30,000 more than in 2012. One-third of them gave Hiko-nyan as the main reason for visiting. 2014/3/30 14:20 Mitsui Outlet Park in Ryuo and other shopping malls were busy this weekend as shoppers try to beat the 8% tax hike starting on April 1. Click here for Shiga History Apr.-June 2014.